At its heart is Office itself—the familiar Office applications businesses use everyday—now offered as a cloud service, so it’s always up to date. But Office 365 is also so much more. It’s about bringing enterprise-grade services to organizations of all sizes, from online meetings to sharing documents to business-class email. Get 1TB of space in the cloud to store, backup and easily share files. Files are accessible from almost any device, also synchronized offline and available without an internet connection. A social network that helps your company stay connected, share information across teams and make faster, more informed decisions. Get peace of mind knowing your services are available with a financially-backed 99.9% uptime service level agreement. Large, 50GB mailboxes that can send messages up to 25MB in size, with contacts, shared calendars and spam and malware protection that stays up to date. Built with Exchange email technology, the leading email solution for business around the world. Use your own custom domain for your email address, connect with Outlook for fully featured offline support, and access via the web through any modern browser. Available on your PC or Mac, as well as Windows Phone, iPhone, Android and Blackberry devices. Wherever your people are, online or offline, they can get to—and work with—the most up-to-date versions of the files and tools they need to get things done. And they can do it on virtually any device. Office 365 offers business-class email, shared calendars, IM, web conferencing, and access to the most up-to-date documents stored in the cloud. You can work together in real time without compromising security. ... And How Companies Consume IT. Office 365 is available as a simple monthly subscription. Avoid large up-front costs for new software while moving the cost of IT from capital to operating expense. Since Office 365 is in the cloud, it is always up to date. No patches or software upgrades necessary. 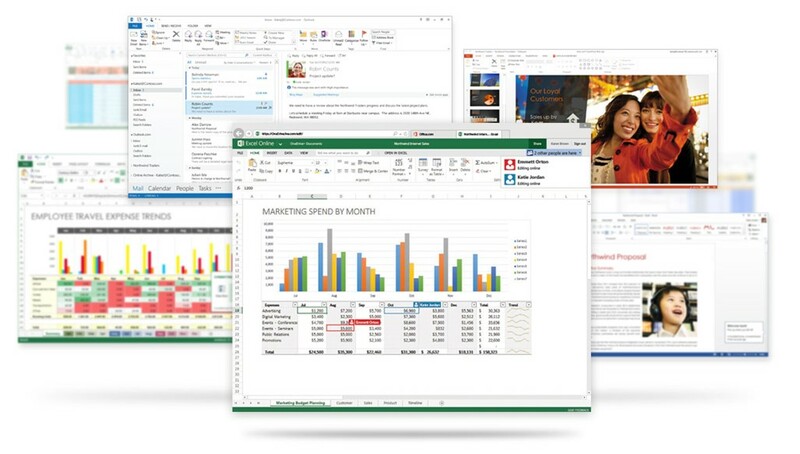 Microsoft is adding new value and capabilities on a monthly basis. no longer purchasing new server hardware. Simplify licensing while providing each user access to business critical technology on 5 PCs/Macs and 5 mobile devices. Save money when compared to traditional, per device licensing. Office 365 grows with you. Adding a new user is as simple as buying an additional license. Office 365 provides many plans to fit the right capability needs and price points for each user in your organization.